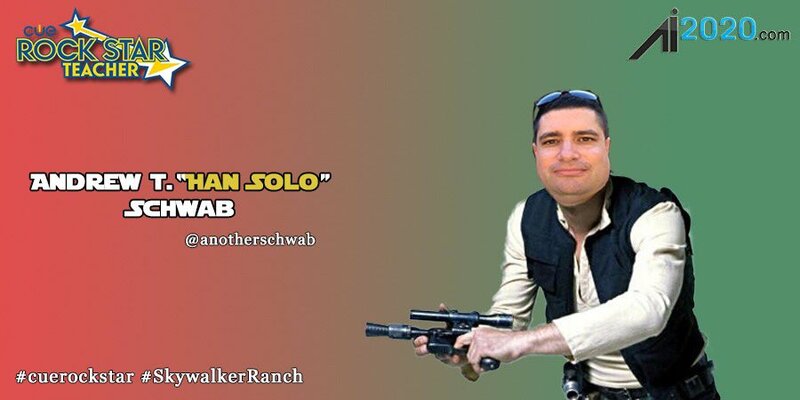 I’m going to stick with the Tech as Tool theme for a bit longer because what I loved about Rockstar Admin Camp was the focus on culture, leading and pushing mindset. There were plenty of tech tools present, but the conversations didn’t start and end with them. While it was cool to help one of our principals build a walkthrough form with automated email replies (thank you @Chaugen, Google Forms and FormMule), Rockstar Admin did much more. Over the last three days, my thinking around integrating tech into the classroom has been reignited and supercharged. So lets flesh out the tool metaphor a bit and consider the simple paint brush. Using the same paint brush, someone can paint a house, a stick figure or the Mona Lisa. Becoming proficient with a paint brush (painting) and creating art with one are two very different (but dependent) things. Through years of practice the artist may develop their craft to the point where a painting like the Mona Lisa becomes possible. Or they might not. Over that time, the paint brush may change somewhat, but probably not too much. It is generally the technique, honed through the experience born from trial and error, that evolves to the point where the Mona Lisa becomes possible. Teaching is very much a combination of art and craft. While the art side may be inherently related to individuality and uniqueness, the craft most certainly comes from developing instructional techniques over time. Many of the techniques currently in use across classrooms everywhere were designed and built for the tools of the day. That day being the turn of the century. Overheads, Whiteboards and even to a large extent, SmartBoards, weren’t sufficiently transformative as to require new techniques. The introduction of 1:1 technology has changed that. As artisan and craftspeople educators, it is our responsibility to adapt the profession’s techniques to the tools of today. Unfortunately, much of the PD being offered today is focused on the tools. That by itself isn’t an issue. What is an issue is the lack of discussion about new (or adapted) teaching techniques specifically designed to effectively integrate technology into instruction. I think it’s been missing because not enough of us have had access to the devices to have a profession level discussion around it. That is changing. Basic tool PD (or training) is needed but the rapid expansion of student devices has exposed a real need to focus on the HOW of teaching again. On my first day of teaching I had never been through a credential class, had no curriculum (and no lesson plan!) and only a vague idea of what I should be doing as a “teacher”, mostly from having watched other teachers while fixing computers in classrooms and skimming the Harry Wong “First Days of School” book a few days before. What I did have was a lab full of computers and the memory of school not being much fun when I was a kid. I wish I could say I just went with the computers and focused on engaging kids, but it took me a while to get there. Instead I used some of those First Day of School techniques and tried not to smile until Christmas. What I quickly discovered was that in a 1:1 learning environment, most of what I was learning about classroom instruction in my credential classes really didn’t apply. Two things saved me there. First, my CTE credential program focused more on Adult Learning than classroom instruction (or maybe that’s just the part I remember the most). Second, I was able to seek out and visit folks that were pushing the 1:1 learning envelop to supplement my credential classes lack of instructional specifics. As it turned out, I had some amazing innovative educators nearby. The things I learned from them (and also through more trial and error) that I found the most useful were usually the techniques they were using to integrate technology into their classrooms. The challenge with technology is that the tools change fast and by fast, I mean FAST. That makes mastering tools a constant moving target. What we need as educators are instructional techniques for effectively using technology that can transcend tools. Interestingly enough, much of what I learned technique wise back in 2009 is still relevant in 1:1 classrooms today, even though the technology tools have changed substantially since then (remember the days of crashing a google doc with more than 20 collaborators?). Unfortunately, the current instructional techniques paradigm was built around concepts like limited access to information, a lack of student devices, scripted curriculum and explicit direct instruction. These are the mainstay techniques that have been used in our classrooms for the last fifteen years. I feel very lucky to have escaped that reality even though I spent many a late night cursing under my breath as I was neck deep in developing my own curriculum by pulling in resources from all over the web, trying to survive as a new teacher and wishing someone would just hand me a binder full of units so I could get on with “teaching”. I get it but I also recognize we need more and better (more better?) for 1:1 learning environments. We need simple, effective and approachable techniques that teachers (and students) can, in the words of Jon Corippo, “Level Up” through as they add more and more technology into the mix. Techniques that can effectively start out on paper and transition to digital. Techniques that engage kids in information literacy, critical thinking, collaboration and presentation. Techniques that harness the power of technology to save teachers time and improve learning outcomes for kids with real time feedback. We need new techniques built for 1:1 technology integrated learning environments that are flexible. They can’t be dependent on a specific tech tool or packaged curriculum to function. We need techniques designed more like lego Mindstorms, where tech tools can be interchanged as easily as changing out one lego for another as they come and go (or dare I say, based on individual student preference). And that is precisely why we need PD opportunities like Rockstar Camps. Places where educators can come together to unlearn what they have learned. Where we can collectively build the future of learning we wish to see in the world. Where we can jump into the Hero’s Journey’s and together take the path less traveled. Bravo CUE Rockstar Admin Camp, Bravo. Today was Saturday. Attendance was a bit off from Friday. By a bit I mean like 50%. That was ok because it meant more opportunities for seats with a view of the lake during lunch. @jkloczko got those brave remaining few up and dancing in public during the morning keynote. The disco ball must have had hypnotic powers. @principalUMS took the opportunity to take pictures of me attempting to dance which I am sure will factor into some future edtech request. Our team excused ourselves from the morning Hero activity and reflected/brainstormed to come up with next steps. We’re definitely sending more people to the next Admin Camp in April. Oh yeah, CUE announced another Admin Camp in April. And we are hosting a Rockstar Black Label event at our district in April too. The final sessions didn’t repeat, which threw us for a loop. After two days of repeating sessions, we were used to being able to attend as a team, but today the team split up. We all made it back in one piece for lunch. Lunch was a caesar chicken wrap. That’s important. Having survived our individual sessions, the team shared out over lunch. At some point during lunch I remembered the online companion guides, with all of the session resources, and I may have tuned out for a bit while staring at the ducks floating on the lake. After lunch, there was an unconference, which I think was Jon Corippo‘s new code word for “time to visit the gift shop and head home”. I should have skipped the gift shop. Wine is heavy. Ran into some mild traffic on the way home. Typical. Missing the Special World already. I might have to join the team in April, you know, because the Journey never really ends. It’s hard to leave good PD events; always feel like I left a part of myself back there… not feeling whole. I’ve got more ideas running around in my head but these are the main themes. 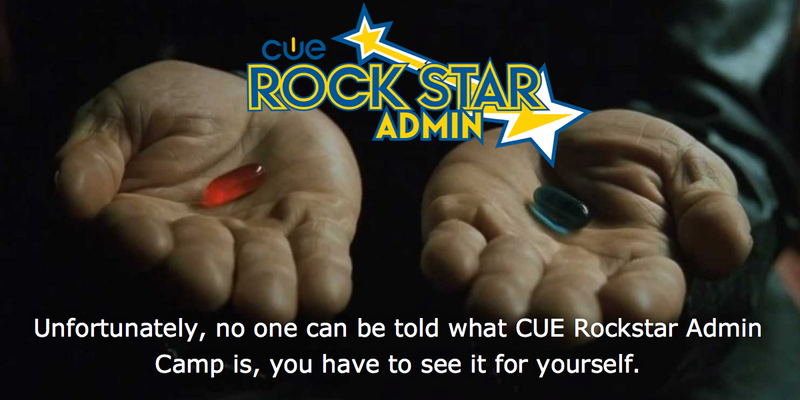 Thanks CUE Rockstar Admin Camp for pushing my thinking yet again. Always nice to stretch outside the comfort zone. Helps to stand on the shoulders of exceptional lead learners. It’s my final day in the Special World and I’m missing it already! I think we say Technology is just a tool so as not to scare people away from it but the truth is, technology is a powerful disrupter of the status quo and the idea of disturbing the status quo is very scary to a lot of people. As Jon Corippo said to me recently, if we as educators are merely content delivery systems, then replacing us with technology will only get easier and easier. Anyone can deliver content, even (and especially) an Internet connected computer. As Educators, the art and the craft of our profession is in designing the learning experiences in our schools and classrooms. In the age of ubiquitous access to content, we are responsible for more than just access to the what, we are, now more than ever, responsible for the how of learning. The challenge is to effectively utilize the transformative powers of technology to engage, inspire and connect kids to their own learning, to build a compelling how for all students. The highlight of my Rockstar Admin Camp Day 1 was hearing from Joe Sanfelippo about how his district is using technology to connect his community and his students to share their stories. It’s an amazing example of how technology can be used to build transformative cultures that support student learning. #gocrickets. Having attended the first two Rockstar Teacher Camps (2010 & 2011), I’ve been a fan of the Rockstar experience since the beginning. While the content is great, it’s not particularly unique to Rockstar (don’t tell anyone I told you so). It’s the structure of the event (the how!) that really makes Rockstar the powerful professional development learning experience it is. Longer sessions, longer (collaborative) lunch, time to meet new people, time to meet the Rockstar Faculty, just enough session choice to allow for differentiation without being totally overwhelming. The learning environment at a Rockstar camp is no accident, it’s by design. What reinforced that idea for me again on day 1 of Rockstar Admin Camp was browsing through all of the session content. Because at Rockstar, it doesn’t matter what session you physically chose to go to on Day 1, you will have access to all of the content online. Which tells me, learning at a Rockstar Camp isn’t about shoveling stuff at me in powerpoint slide decks, or showing off the latest and greatest tech tool (although AudioBoom is pretty cool). It’s about building an environment, The Rockstar Camp Experience, where learning happens and content is just another resource in the room. To wrap things up, Corippo came out with a great session title a while back, “HOW to do Common Core – we already know the WHY”. In my head somehow I’ve managed to subvert that into, “HOW to do Common Core, we already know the WHAT.” Because at the end of the day, standards are standards, it’s the how we teach that really matters to kids and Rockstar is all about the how. That would be my 2am, can’t stop thinking about Day 1 attempt to explain the power of a Rockstar Camp but really, you should experience one for yourself. Technology is more than just a tool, it is a total game changer. To paraphrase an old Jedi Master, we must unlearn how we learned. To my mind, there are several transformative opportunities for teaching made possible by technology that go way beyond trading paper and pen for a Chromebook or iPad. In a classroom where students have anytime access to the Internet at their fingertips, the opportunities are endless. This is a big shift in thinking about how information should be presented to students; no longer wrapped and bound in a sequenced set of pages, but rather presented as a guided discovery process with hidden nooks and crannies and undiscovered continents behind every new question. Learning should be an adventure, not a fixed stairway that eventually leads to a single doorway. In the 21st Century, the literacy of searching, of accessing information, should be as fundamental as reading and writing. The end of week quiz must have been born from necessity, a form of feedback that was made super simple by the Scantron (thankfully I skipped them in my classes but sadly still managed to mirror the experience with Moodle quizzes). The drawbacks of the Scantron, or weekly spelling test or INSERT ANY TRADITIONAL PAPER QUIZ/TEST HERE form of assessment is that the results have a built in time delay, namely the teacher’s grading cycle. With technology tools like Socrative, Kahoot and heck, even a basic Google Form, the feedback cycle can be cut to ZERO. Kids can know immediately wether they got something right or wrong, and giving the test over and over again until everyone (or the magic 80%) get it right, is super simple. Why everyone isn’t jumping on this form of instant feedback assessment is beyond me. It may take a bit more effort to initially setup (no way it’s as hard as building a Moodle quiz) but once it’s done, the time savings alone are worth it. Oh yeah, and it’s better for kids too. Dare I say transformative? Google Docs. It’s all there. Real time student collaboration with teacher monitoring and input. Asynchronous collaboration with tracked changes. It’s freakin amazing and still there are folks out there that see Google Docs as just an App to use like Word. Nope. Because kids can work together to solve problems, answer questions, form hypotheses, develop stories, INSERT ANYTHING YOU CAN IMAGINE HERE. The possibilities are endless. Real collaboration, used to solve real problems, is the employment currency for the next generation. Technology has transformed how people communicate, collaborate and work in the real world, our classrooms have to adapt to that new reality. It used to be if you wanted to be a TV Star, you had to somehow have access to a hundred million dollar TV network. Not many people made it because not many people had access. Creating, producing and distributing TV shows was expensive. Now, the cost to create and publish is effectively ZERO. That means everyone can be a TV Star. YouTube is the prime example. If everything a student produced in class, call it an artifact of learning or an assessment, was published online to a learning history, how powerful would that story be? The cost to do it is no longer money, now it’s mindset. Publish often or perish. Learning to present, argue, persuade to a real audience, in the digital mediums of the present, outside the four walls of the classroom, is certainly transformative for students. Just a tool. Really? What do you think?